Cheap imports and bird flu scares have taken a toll on domestic poultry firms. In particular, a type of chicken known as poulard -- young hens that have been spayed to fatten them -- are being targeted. She Feng, general manager of Beijing-based Huadu Foodstuff, the biggest chicken provider for the Beijing 2008 Olympic Games, said: "They are too cheap. They are eating into our profits greatly." China announced dumping and subsidy probes on chicken and auto products from the US on Sept 13, two days after US President Barack Obama imposed tariffs on tires from China. Chinese industries complain that they're being hurt by "unfair trade practices", the Ministry of Commerce said on its website. 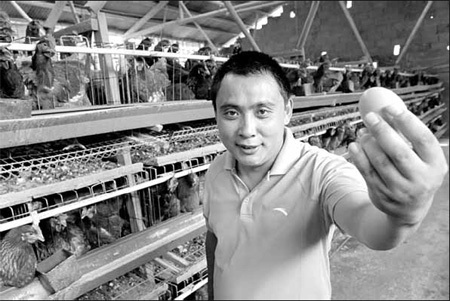 The dumping investigation relates to poultry alone, a spokesman said in Beijing. Ma Chuang, deputy secretary-general of the China Animal Agriculture Association, said investigations into the issue had been going on for nearly six months and the results were sent to the Ministry of Commerce formally in August. "We did it on the basis of complaints from domestic companies and relevant investigations," said Ma. China imported 790,000 tons of poulard products in 2008, of which more than 73.4 percent was from the United States. In the first half of this year, more than 300,000 tons -- 89 percent of imported poulard products -- were from the US. Ma said US poulard was 300 to 500 yuan cheaper than domestic poulard per ton. Luan Wentong, vice-chairman of Shandong Industrial and Commercial Federation, told the local lawmakers of Shandong province in February this year that imports of cheap poulard were forcing more than 6,800 local producers to struggle for survival. Shandong province is the main domestic base for poulard production, forming 20 percent of the industry and 50 percent of the nation's exports. According to data collected by Luan, imported chicken thighs cost 5,000 yuan per ton after freight and 7,000 yuan at the market, while the average cost of domestic processing companies is 9,000 yuan per ton. Ma said subsidy support from the US government for soy and maize reduced the feed cost of poulard products. Feed makes up 70 percent of the entire cost of raising poulard. Ma added other benefits including credit support were also implemented by the US government to stimulate exports. In June, China said it had asked the World Trade Organization to set up an experts panel to investigate US restrictions on imports of Chinese poultry products. Beijing told the WTO's dispute settlement body that Washington had imposed protectionist measures in completely banning Chinese chicken products entering the US market. The US said it was examining whether Chinese poultry was safe for human consumption. "Chinese poultry companies have been struggling over the past couple of years amid bird flu and a flood of imports, and the financial crisis is making that worse," Ma said.